Out of Pages is a subscription service that will send you a new notebook on a specified schedule — every month, or every 2,3,4, or six months or once a year. They break up the costs for the more frequent delivery to an initial fee plus a monthly charge spreading out the costs of the notebooks throughout the year. They have a limited selection of notebooks: just Moleskines and Field Notes at present but if either of these are your notebook of choice, then this is a great way to keep a fresh one coming as you need it. You can get a fresh kraft paper Field Notes sent to you every month for $4.20/month. Or a large (5″x8″) Moleskine hardcover can be delivered quarterly for $12.80 up front and $5.60/month. Or get a combination of notebooks on differing schedules. I love the idea of subscription delivery of items you use regularly, be it socks or notebooks so I think there’s a lot of appeal to this. I hope Out Of Pages will add some other notebook options like Rhodia Webbies or Doane pocket notebooks for a greater variety or options in the near future. Would you subscribe to a service like this? Have you recently considered purchasing a stonewashed blue AL-Sport Kaweco like Mr. Dudek? Wouldn’t it look fabulous next to the new Word. notebooks in indigo? Yup. I’m here to keep your pockets coordinated. I wanted to let you all know that The Well-Appointed Desk has a new sponsor, Gallery Leather! I reviewed their leather-covered journals and notebooks not too long ago. 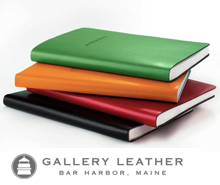 I wanted to welcome Gallery Leather to the site and hope that you check out all their products which are assembled in the USA in Maine. 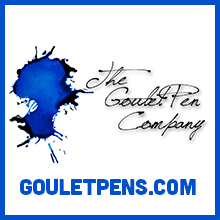 Their sponsorship helps keep me in pens, paper and pixels. I was wondering if you have ever seen one of those books in a golden color? I have one ins the green but would love to have a few golden colored ones. It appears that like Henry Ford might have said, “You can have any color Federal Supply notebook you want as long as its green.” That said, if you’re looking for a durable notebook in a golden color, you might want to try Rite in the Rain. I love the stamps I bought at your store! I’m a stamping neophyte and have two basic questions about care and storage. 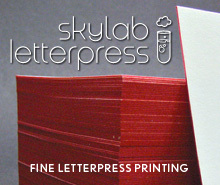 What is the best way to clean a rubber stamp when I want to use a different color ink? How should I be storing my stamp pads? I have rubber bands around them now to keep the lids on, but wonder whether I should have them in some sort of air-tight container to keep them from drying out. Thanks, Rachel! I’m so glad you like the stamps. To clean stamps, I use a damp paper towel on a ceramic plate to clean my stamps between colors. After stamping, I wipe the stamp gently on the wet towel and then use a dry towel to remove any excess moisture. If a stamp gets left with ink on it, I will add a drop of dishwashing liquid to the wet paper towel to loosen up and remove the dried ink. I do not recommend submerging the stamps in water or ever using any harsh soaps or detergents to remove ink. On a particularly crusty stamp, dip an old toothbrush into a cup of water with a couple drops of dishwashing liquid and then gently scrub the stamp to remove ink build-up. If you use a stamp pad regularly, keeping the lid closed and stored flat, should be enough to keep the pad from drying out. As for storing stamp pads, I either use a rubber band to keep the lids sealed or bits of tape, depending on how often a particular stamp pad is used. I store my large stamp pads on their ends so tape or rubber bands are a must for keeping them from drying out. But stamp pads, no matter how they are stored, will not stay fresh indefinitely so use them up and re-ink when possible. Happy stamping! PS: You might enjoy my post about different types of stamp pad ink. Moleskine recently unveiled their new Art Plus Sketch Album which explicitly called out the weight of the paper stock on new books is 120 gsm (80lb). Its a cardstock cover book available as a pocket or large “reporter style” though they show it used horizontally on the site, or a 7.5″ square size. Each book has 88 pages and retail prices are $7.95 for the pocket (A6-ish) , $13.95 for the large (A5-ish) and $19.95 for the 7.5″ (19cm) square. I am willing to try one out so that you, my fine readers, do not have to blow your hard-earned cash if these are not a real improvement over the regular paper (terrible for anything but pencil) or the “sketchbook” stock which was water-resisting, manila card stock. I ordered one and expect to have it for review in a week or so. If it is terrible paper that makes me shout profanities, there will be a bonfire and you’ll all be invited. Tad Carpenter, a Kansas City illustration celebrity, has recently produced a notebook with a great typewriter illustration on the cover. The notebook is softback with a textured cardstock cover and each page is lined. On the inside covers are pencil patterns and on the front cover it says “Inspiration is Everywhere”. There’s a place on the first page to write your name. The paper is smooth, bright white and interspersed in the book are eight illustrated quotes to inspire and delight. The lines are wider than I prefer but they are a teal blue with a pencil illustration in the upper lefthand corner on the left hand pages. The lines are a little wobbly like they were hand drawn which makes them fun and cool. I wish some of the pages had been left blank with just the little corner illustration so that the book could be used for writing or sketching. I didn’t do a full-fledged pen test but the paper seems decently weighted so that it could probably handle a lot of everyday writing tools. All in all, this is a super fun notebook and sells for $8 so what’s not to love? While you’re shopping on his store, check out the new Kansas/Missouri print: “A city so great, one state couldn’t contain it!” ($25) or his epic quote print “What I love most about my home is who I share it with” ($20). I’ve finally been wooed into trying the Rhodia pads for pen and ink reviews. I chose the Rhodia Pad No. 18 ($14.50) with the black cover. The large size (8.25″ x 11.75″) gives me plenty of real estate. The pages tear from the top with a smooth microperf and the cover folds neatly out of the way causing no lefty anguish. It was something that I was concerned about but, in actuality, there is little discomfort since the top folds flat, not the awkwardness of wire rings or other impediment. The black cardstock covers are super glossy and scratched easily. My cover was noticeably worn in the time it took me to write a few reviews. I don’t suspect the pad will be kept closed much so I won’t notice but if this is something that will bother you, the classic orange covers may hide the wear and tear a little better. The paper is the posh Clairefontaine 80gsm bright white and I chose the blank (uni) version so that no mater how dark or light my inks were, lines or grid would not distract. I find the dark purple grid lines of the Rhodia paper to be too dark and distracting. The blank paper is a clean, bright white so ink colors show true. I like the soft white of the Rhodia webnotebooks but for ink reviews its imperative to use a bright white stock. In my writing samples, none of the inks bled through to the reverse side and there was very little show through at all. I could definitely get use out of both sides of the paper. Not one of the materials I tried feathered on the paper though, for some reason, the red Platinum Preppy Fountain Pen ink took an age to dry. I don’t find the Preppy red to take that long on cheaper stocks. All the other fountain pen inks dried quickly. Pencil smudged a little bit but this is probably due to the smoothness of the stock. Pencil wrote beautifully on the paper. When a review is finished, I can tear it out of the pad and file it. I will probably 3-hole punch the pages and store them in binders by category in the future so that it will be easy to go back and refer to previous reviews. Overall, I’m quite pleased with the pad. 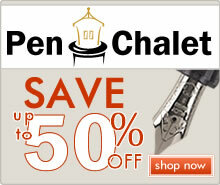 It meets all my reviewing needs and is excellent paper for all types of ink and graphite.